India and Argentina have complementary strengths which offer potential for strong bilateral ties, according to Argentina’s Vice-President Gabriela Michetti. NEW DELHI: India and Argentina have complementary strengths which offer potential for strong bilateral ties, according to Argentina’s Vice-President Gabriela Michetti. But on her first visit to India, what engaged her most was the spiritual aspect of this country. Her first impression as been “fantastic”, she said, “especially the way Indians serve visitors”. “It is very nice to see that there is an ancient culture that is reflected in everything. 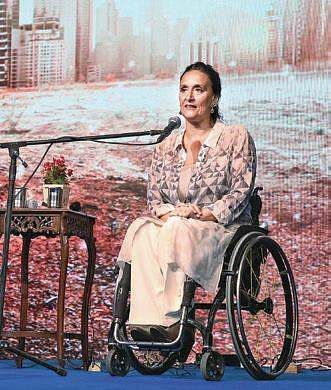 There are vibrations of the past, and everything that implies Indian culture is definitely felt.” Michetti, who travelled despite being confined to a wheelchair since an accident in 1994, has wanted to know India for a long time. Her visit came about following an invitation from the Brahma Kumaris spiritual group to attend a retreat and a conference in Delhi. Michetti met Vice-President Venkaiah Naidu and interacted with NGOs working for the disabled. So what piques her interest in India’s spiritual side? “The spiritual dimension has always been present in my life... I am grateful to my parents because they transmitted their faith to me.” Michetti, who has been in public life for 30 years, believes that politics needs spiritual content. “When one believes in God, it gives a lot of meaning to what one does in politics. One doesn’t see one’s equals as enemies; it may just be that we think differently. That allows us to perform qualitatively better actions. Even otherwise, she says, Argentines know a lot about India. “Middle-class people in Argentina can afford to visit India more than once in their lifetime. In the last few years it has been more so.” Michetti sees a lot of scope for closer India-Argentina ties. “The relationship is growing a lot. Argentina is a great producer of food (India is the biggest buyer of Argentine soyabean oil, accounting for 50 per cent of the production), and India is developing a lot of technologies that Argentina requires.